We are passionate biodiversity scientists who want to apply the best information to decision-making. Change is made one decision at a time. And every good decision starts with good information. 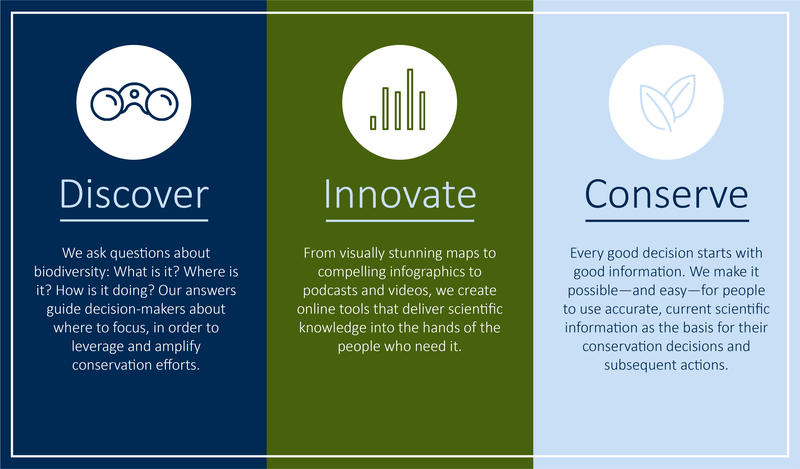 We want to make it possible—and easy—for people to use accurate, current scientific information as the basis for their conservation decisions and subsequent actions. We provide the scientific knowledge that supports informed decisions. 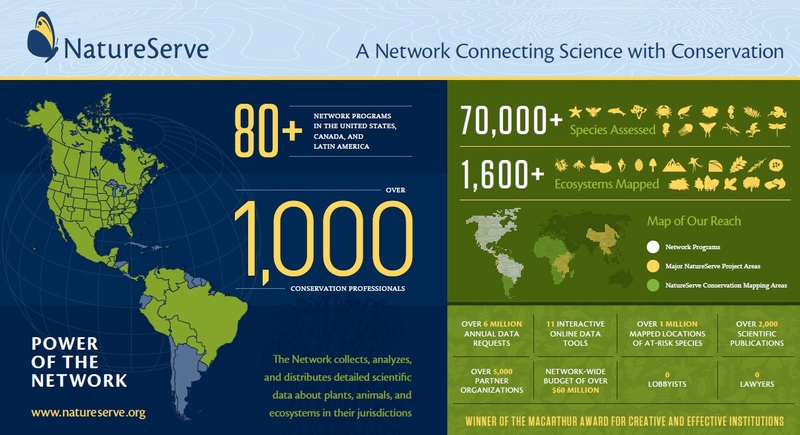 Together, with our Network of over 80 programs, we collect decision-quality data about imperiled species and entire ecosystems, transform that data into knowledge products and visualizations, and provide meaning through expert analyses and support to guide decision-making, implement action, and enhance conservation outcomes. Our work is guided by several key questions. What species and ecosystems exist? Where are they found? How are they doing? What actions will help? Are the actions working? Imagine that every person in your community has easy access to this knowledge. A local land trust with limited resources protects land with the highest conservation value. A transportation agency builds in a different location to avoid at-risk species, protecting nature while also saving time and money. A city develops a plan to maintain healthy ecosystems in their watershed because it helps provide clean water for their residents. A scientist learns which factors most strongly influence species and ecosystem vulnerability to climate change in a particular region. As rapid changes threaten our planet and all life that depends on it, someone must keep their finger on the pulse of the planet and its plants and animals whose future depends on conservation action. The NatureServe Network fills this role. We are on the front lines of halting the decline of biodiversity, with our focus on the prevention of species and ecosystem declines and the conservation of vulnerable species and the places most at risk of disappearing.